On the afternoon of February 2, Western disturbance ’18’ would be over NW Iran and adjoining Afghanistan by the same night, it would be over Iran-Afghanistan-Pakistan (north-western Balochistan). During that time, trough from this WD would be over western Balochistan extending till Makran coast with thunderstorms. On February 3, it would be over central Afghanistan but its trough would cover much of the country extending till Karachi coast. On February 4, the western disturbance ’18’ would be situated over northern areas of Pakistan while the thunderstorms over southern parts over Sindh including Karachi could move into Indian state of Gujarat. Western disturbance ’18’ would stay over the northern areas from February 4 till February 5 night where it would weaken on February 6 morning and start moving into north-western India where it would stay till February 7 before finally its clouds spreading and it would be much dissipated. On February 4, weak cold winds may penetrate into the country especially the northern areas. Northern areas – Torrential rainfall may occur! Extreme rainfall in the north! During the first week of February (February 2 till February 6) some 120+ mm precipitation could in the areas of Muree (Punjab), Muzaffarabad (Azad Kashmir), Kalam (Khyber-Pakhtunkhwa), Besham Naran (Khyber-Pakhtunkhwa), Dasu (Khyber-Pakhtunkhwa), Saidu (Khyber Paktunkhwa), Kagan (Khyber Paktunkhwa) and Mardarn (Khyber Paktunkhwa)and other adjoining areas. Heavy snowfall/blizzard could occur over northern areas including Murree. During this period, rainfall of 50 mm to 75+ mm rainfall could fall in capital city of Islamabad with thunder/lightning and fast winds (50 km/h to 56 km/h). While in Punjab especially north-eastern parts that are Sialkot, Jhelum, Gujrat, Gujranwala and Lahore – there could be rainfall with thunder/lightning along with fast winds. Rainfall of 60+ here as per latest analysis. The most heaviest precipitation could occur in the above mentioned areas. South Punjab that is Multan, Bahawalpur, Bahawalnagar, Rahim Yar Khan and adjoining cities may experience a light rain shower with chances of moderate falls (western areas of south Punjab have slight chances of isolated heavy rainfall) that would remain below 30 mm on February 3 till February 5 early. Southern areas – Rain coming to Karachi? There are chances of shower/rain with chances of moderate falls in other areas of Sindh that is western and upper parts (Dadu, Hyderabad, Thatta, Nawabshah, Sukkur, Larkana and other surrounding cities) on February 3 till February 4. Powerful Winter Storm Western disturbance ’18’ moving away from the country, the storm center has moved into extreme northern areas while few thunderclouds are over northern areas, chances of moderate rainfall with isolated heavy falls and strong winds till night in the these areas. Tomorrow the sky would start to clear up in these areas with chances of isolated rain till morning/mid-day, with each passing hour the storm is weakening. A coldwave has also entered the southern parts and likely to extend into the northern areas from tomorrow morning. It has broken snowfall records while caused 200+ mm rainfall in few cities. Another weak WD ’19’ may affect during the coming week. It is highly weak when compared to WD ’18’. Powerful Winter Storm ’18’ continues to unleash widespread heavy downpour/blizzard to the northern areas of the country with strong gusty winds. Chirat got 148 mm, Saidu Sharif got 138 mm, Risalpur got 136 mm, Lower DIR got 107 mm, Islamabad got 69 mm rainfall, showers also occurred in parts of Sindh while Karachi got hail with heavy showers. Showers in Sindh occurred from the second wave of thunderstorms that formed after the first one left for India. More severe weather conditions likely in the north as intense thunderstorms are present over north-western areas, the severe weather conditions to end by tomorrow night in the northern areas. Western disturbance ’18’ intensified again into a powerful winter system and now lies over eastern Afghanistan and adjoining north Pakistan, its trough is extending towards southern parts and would leave the southern parts and the Sindh coast including Karachi from late tonight. (On February 3, rain occurred in Hyderabad, Larkana, Sukkur, Jacobabad, Shikarpur and Dadu while light shower occurred in Karachi (6 mm)). There is a strong thunderstorm forming over north-western parts of Pakistan that can bring some heavy downpour/snowfall to the northern areas. Rain at times heavy to continue in Islamabad with fast/strong winds. (Moderate rainfall has occurred in Islamabad, Peshawar, Quetta while snowfall occurred in Chitral and light shower in Lahore). From February 4, WD ’18’ main focus would be northern areas as it moves into the country, rest of the country would witness clear skies. Weak Cold winds are expected in the country from tomorrow. 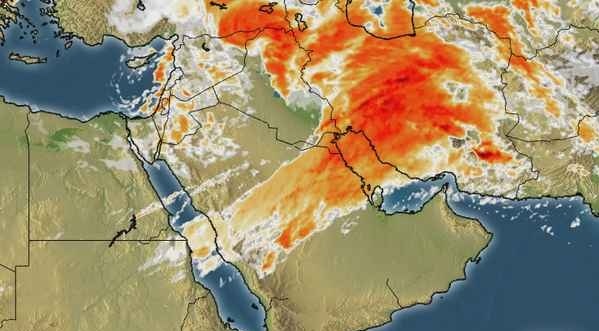 Powerful Western disturbance ’18’ has weakened after leaving Saudi Arabia, it has brought severe rainfall to the Arabian city of Jeddah where 111 mm rainfall has occurred while ten people have lost their lives. According to PWP’s update issued on January 31, the western system as forecasted is over Iran-Afghanistan-extreme western Balochistan and likely to re-intensify into a powerful winter storm. ← Second Winter Outlook (2012 – 2013): Pakistani Winter losing power in 2013? @ K.M, IN KARACHI 24 HRS THERE IS ONLY NEWS FOR TARGET KILLINGS, BOMB BLAST, STRIKES ETC. NO GOOD NEWS FOR KARACHI. There are good news but Channels doesnt show it..
how much precipitation could occur in lahore because websites are giving diff. analysis. as acording to u it is a strong system so max. possibility of how much rain in lahore??? True Karachi day by day is becoming very very dangerous! Yes, clouds have covered most part of the country but these are not the main clouds as the system is still far away. babar bhai Mirpurkhas ka weather kexa rahy ga yeh system mirpurkhas tk pohanchy ga ya nhi??? Some clouds may reach the city with chances of drizzle/isolated shower but Mirpur Khas is away! we all pray for whole Pakistan and especially Karachi. very nice and detailed weather update…..
2 se 3 din itna ziada barish…….islamabad me Nala lai me flood aasakta hai kia??? Hmm..cant say much about that but heavy downpour is likely in Islamabad! Did mention Multan as well… chances of moderate rainfall from tonight. Sir IMD had said that severe weather is expected in rajashtan which is near to sindh so is there any possiblity of severe weather in any part of sindh?? I think most severe weather likely to occur in north Pakistan. Tonight there are chances of rain in Karachi! What is the possibility of another large western disturbance like this before the arrival of summer? This WD is somewhat special, unlikely that another similar WD would affect the country any time soon. I don’t know about other areas but it’s raining heavily here. Rain started at 2AM and still raining heavily. It did rain heavily but the highest recorded is 6 mm. 6 mm ? Are u kidding me ?!?!? No WAY!! It was way more than that I can tell. I also think it might be heavy..
Sir i have confusion regarding weather,,last night it was raining lightly in our area(nawabshah) but when i awoke in morning i saw clear sky but in mid afternoon again clouds covered sky and it begins drizzle and again sky become cleared and again in evening it is raining so why that inconsistenancy? It was the fist wave of clouds that went into India at the same time another wave of cloud was building up in Iran that started affecting Sindh today. slam Babar bhi ” do u think when there are abnormal high rains and snowfall in winter, so the next monsoon and summer will also be disturbed and there will be abnormally high rains and cyclones in next summer? Country experienced a below normal rain this winter and this WD ’18’ is filling the gap by throwing all the water in one go which shows the strength of this WD. Summer could come late thus affecting the monsoon. From last few years i can see some abnormal weather in our area swat sir,abnormal winters and and abnormal summers, e g 2010 floods,heavy snowfall,last monsoon below NORMAL rains,this winter storm which brought heavy snow fall here ,do think sir this anomaly and abnormal weather trend will continue? The monsoon of 2010 and 2011 was abnormal, since the start of 21st century Pakistan has witnessed a number of abnormal weather events in a short span of time. it is too much windy weather in lahore frm last 2 days so plz tell about its continuity??? The storm is moving away and a coldwave is entering Lahore. Weather was very pleasant because of this wd for past 2 days but i was left disappointed as it did not rained as much as was forecasted…Will it rain in Lahore tonight or tomorrow? I think below 50 mm rainfall occurred in Lahore, the thunderstorms mostly stayed over NW Pakistan. on the other hand Multan got 52 mm. Its going to stop soon.